This process happens repeatedly during therapy. Even after three, four, five years, the breaking and the remaking happens. The shattering and the putting back together. After time, it becomes a little easier to bear. Familiar in its recurrence, less shocking in its predictability. Maybe a little less painful – as if the pain has had its edges knocked off by repetition. 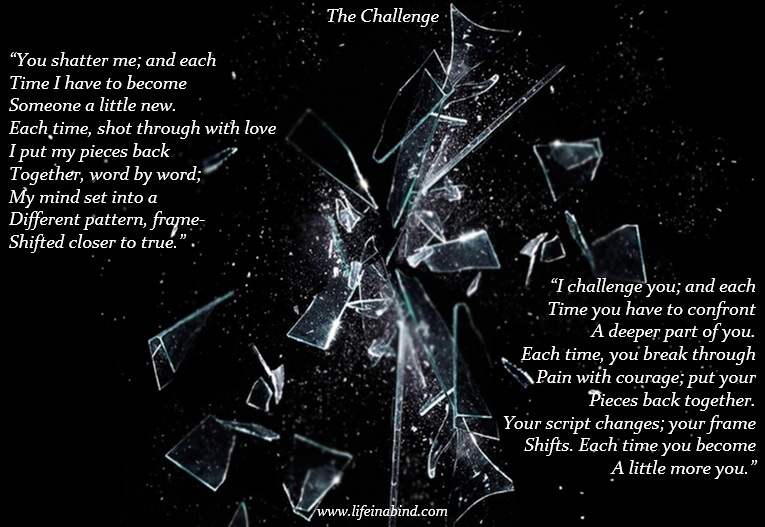 If only it were the mirror that could shatter and by putting itself back together could show me a different me. Instead the mirror stays steadfast and it is I who must repeatedly break and reconfigure until what I see reflected bears more resemblance to the truth. Or at least, what my mirror tells me is the truth – my breaking is far from finished. The mirror flashes back at me all the different shards of myself; the ugly, jagged parts which I have to hold gingerly, but firmly, like infant selves, to fit them back into a whole. The trouble with being broken in order to be righted, is that it can feel like the old breaking – the one that left us scarred and misaligned. The solution can feel a little like the cause, until we see that it’s the presence of the mirror, waiting to show us our true reflection, that makes the difference between the two. It never fails to hurt me, this breaking. It never fails to amaze me, either. Categories: Therapy | Tags: being challenged in therapy, borderline personality disorder, BPD, change in therapy, perfect mirroring in therapy, rupture and repair in therapy, self and identity, therapeutic relationship, therapy | Permalink.